Sleep disorders are a group of syndromes characterized by disturbances in the amount, quality, or timing of sleep, or in behaviors or physiological conditions associated with sleep. Although sleep is a basic behavior in all animals, its functions in maintaining health are not completely understood. In the past 30 years, however, researchers have learned about the cyclical patterns of different types of sleep and their relationships to breathing, heart rate, brain waves, and other physical functions. There are five stages of human sleep. Four stages are characterized by non-rapid eye movement (NREM) sleep, with unique brain wave patterns and physical changes. Dreaming occurs in the fifth stage during rapid eye movement (REM) sleep. Stage 1 NREM sleep. This stage occurs while a person is falling asleep and represents about 5% of a normal adult’s sleep time. Stage 2 NREM sleep. This stage marks the beginning of “true” sleep. About 50% of sleep time is stage 2 REM sleep. Stages 3 and 4 NREM sleep. Also called delta or slow wave sleep, these are the deepest levels of human sleep and represent 10–20% of sleep time. They usually occur during the first 30–50% of the sleeping period. REM sleep. REM sleep accounts for 20–25% of total sleep time. It usually begins about 90 minutes after the person falls asleep, an important measure called REM latency. REM sleep alternates with NREM sleep about every hour and a half throughout the night. REM periods increase in length over the course of the night. The average length of nighttime sleep varies among people. Most adults sleep between seven and nine hours a night. Sleep disorders are classified according to their causes. Primary sleep disorders are distinguished as those that are not caused by other mental disorders, prescription medications, substance abuse, or medical conditions. The two major categories of primary sleep disorders are the dyssomnias and the parasomnias. Dyssomnias are primary sleep disorders in which the patient suffers from changes in the amount, restfulness, and timing of sleep. The most important dyssomnia is primary insomnia, which is defined as difficulty in falling asleep or remaining asleep that lasts for at least one month. It is estimated that 35% of adults in the United States experience insomnia during any given year. Primary insomnia usually begins during young adulthood or middle age. Hypersomnia is a condition marked by excessive sleepiness during normal waking hours. The patient has either lengthy episodes of daytime sleep or episodes of daytime sleep on a daily basis even though he or she is sleeping normally at night. The number of people with primary hypersomnia is unknown, although 5–10% of patients in sleep disorder clinics have the disorder. Primary hypersomnia usually affects young adults between the ages of 15 and 30. Nocturnal myoclonus and restless legs syndrome (RLS) can cause either insomnia or hypersomnia in adults. Patients with nocturnal myoclonus, sometimes called periodic limb movement disorder (PLMD), awaken because of cramps or twitches in the calves and feel sleepy the next day. RLS patients have a crawly or aching feeling in their calves that can be relieved by moving or rubbing the legs. RLS often prevents the patient from falling asleep until the early hours of the morning. Narcolepsy is a dyssomnia characterized by recurrent “sleep attacks” (abrupt loss of consciousness) lasting 10–20 minutes. The patient feels refreshed by the sleep, but typically feels sleepy again several hours later. Narcolepsy has three major symptoms in addition to sleep attacks: cataplexy (sudden loss of muscle tone and stability), hallucinations, and sleep paralysis. About 40% of patients with narcolepsy have or have had another mental disorder. Although narcolepsy is considered an adult disorder, it has been reported in children as young as three years old. Almost 18% of patients with narcolepsy are 10 years old or younger. It is estimated that 0.02–0.16% of the general population suffers from narcolepsy. Obstructive sleep apnea syndrome is the most common form, marked by episodes of blockage in the upper airway during sleep. It is found primarily in obese people. Patients with this disorder typically alternate between periods of snoring or gasping (when their airway is partly open) and periods of silence (when their airway is blocked). Very loud snoring is characteristic of this disorder. Central sleep apnea syndrome is primarily found in elderly patients with heart or neurological conditions that affect their ability to breathe properly. Central alveolar hyperventilation syndrome is found most often in extremely obese people. The patient’s airway is not blocked, but his or her blood oxygen level is too low. Mixed-type sleep apnea syndrome combines symptoms of both obstructive and central sleep apnea. Circadian rhythm sleep disorders are dyssomnias resulting from a discrepancy between the person’s daily sleep/wake patterns and the demands of social activities, shift work, or travel. There are three circadian rhythm sleep disorders: delayed sleep phase (going to bed and arising later than most people); jet lag (traveling to a new time zone); and shift work. Parasomnias are primary sleep disorders in which the patient’s behavior is affected by specific sleep stages or transitions between sleeping and waking. Nightmare disorder is a parasomnia in which the patient is repeatedly awakened by frightening dreams. Approximately 10–50% of children between three and five years old have nightmares. They occur during REM sleep, usually in the second half of the night. Sleep terror disorder is a parasomnia in which the patient awakens screaming or crying. Unlike nightmares, sleep terrors typically occur in stage 3 or stage 4 NREM sleep during the first third of the night. The patient may be confused or disoriented for several minutes and may not remember the episode the next morning. Sleep terror disorder is most common in children 4–12 years old. It affects about 3% of children and fewer than 1% of adults. Sleepwalking disorder (somnambulism) occurs when the patient is capable of complex movements during sleep, including walking. 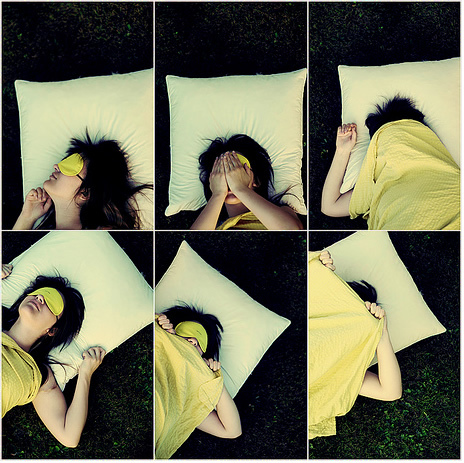 Sleepwalking occurs during stage 3 and stage 4 NREM sleep during the first part of the night. In addition to walking around, patients with sleepwalking disorder have been reported to eat, use the bathroom, unlock doors, or talk to others. It is estimated that 10–30% of children have at least one episode of sleepwalking. However, only 1–5% meet the criteria for sleepwalking disorder. The disorder is most common in children 8–12 years old. Mental disorders, especially depression or one of the anxiety disorders, can cause sleep disturbances. Psychiatric disorders are the most common cause of chronic insomnia. Medical conditions like Parkinson’s disease, Huntington’s disease, viral encephalitis, brain disease, and thyroid disease may cause sleep disorders. Such substances as drugs, alcohol, and caffeine frequently produce disturbances in sleep patterns. Emotional stress and hormone imbalances can also cause sleep problems. Job-related stress is a common factor in sleep disorders. Police officers, firefighters, and other emergency workers have a higher-than-average rate of sleep disorders. Sleeping arrangements can be a factor. People who must share a bedroom with someone who snores heavily sometimes develop sleep disorders. In addition, research has shown that co-sleeping (small children sleeping in the same bed as their parents) is stressful for the children and contributes to sleep disorders. Such prescription medications as antihistamines, corticosteroids, asthma medicines, and drugs that affect the central nervous system can affect sleep patterns. The causes of sleep disorders have already been discussed with respect to the Diagnostic and Statistical Manual of Mental Disorders (DSM-IV) classification of these disorders. The most important symptoms of sleep disorders are insomnia and sleepiness during waking hours. Insomnia is the more common of the two symptoms and encompasses the inability to fall asleep at bedtime, repeated awakening during the night, and/or inability to go back to sleep once awakened. Sleep disorders can have a number of negative health consequences in addition to general feelings of tiredness. Studies have shown that people with sleep disorders are at increased risk of having serious motor vehicle accidents and fatal workplace accidents. Diagnosis of sleep disorders usually requires a psychological history as well as a medical history. With the exception of sleep apnea syndromes, physical examinations are not usually revealing. The doctor may also talk to other family members in order to obtain information about the patient’s symptoms. Psychological tests or inventories are used because insomnia is frequently associated with mood or affective disorders. Patients may be asked to keep a sleep diary for one to two weeks to evaluate the sleep disturbance. Medications taken, the length of time spent in bed, and the quality of sleep are recorded. If breathing-related sleep disorders, myoclonus, or narcolepsy are suspected, the patient may be tested in a sleep laboratory or at home with portable instruments. Polysomnography records physiological functions that can be used to help diagnose sleep disorders as well as conduct research into sleep. Waiting until one feels sleepy before going to bed. Not using the bedroom for work, reading, or watching television. Arising at the same time every morning. Avoiding smoking and drinking caffeinated liquids. Limiting fluids after dinner and avoiding alcohol. Avoiding high-sugar or high-calorie snacks at bedtime. Avoiding highly stimulating activities before bed, such as watching a frightening movie, playing competitive computer games, etc. Avoiding tossing and turning in bed. Instead, the patient should get up and listen to relaxing music or read. According to Prevention magazine, insomnia is the sixth most common condition treated with herbal formulas in the United States; it accounts for 18% of all use of herbal preparations. Some herbs used for insomnia are safer than others. Persons who are using alternative remedies, whether to treat insomnia or other conditions, should always tell their doctor what they are taking, how much, and how often. This warning is important because some herbal preparations that are safe in themselves can interact with prescription medications. Some naturopaths recommend Vitamins B12, B6, and D for the relief of insomnia. Calcium and magnesium are natural sedatives, which helps to explain the traditional folk recommendation of drinking a glass of warm milk at bedtime. Tryptophan may relieve insomnia; as turkey is high in tryptophan, a turkey sandwich as a bedtime snack may be helpful. Melatonin is widely used to induce sleep although adequate studies of its effectiveness are lacking. Acupressure. The pressure points on both heels, the base of the skull, between the eyebrows, and on the inside of the wrists can be used to relieve insomnia. Acupuncture. The specific treatment for insomnia depends upon the cause. Aromatherapy. The use of essential oils of bergamot, lavender, basil, chamomile, neroli, marjoram, or rose promotes relaxation. Ayurvedic medicine. Ayurvedic remedies for insomnia include scalp and soles massage with sesame, brahmi, or jatamamsi oils, a warm bath, or a nutmeg ghee paste applied to the forehead and around the eyes. Nightmares are treated with scalp and soles massage with brahmi or bhringaraj oils, tranquility tea (jatamamsi, brahmi, ginkgo, and licorice root), and yoga. Sleep apnea is treated by changing sleep positions, humidifying the air, and nasya (nose drops) with warm brahmighee. Biofeedback. This technique can promote relaxation. Chinese medicine. Practitioners of traditional Chinese medicine usually treat insomnia as a symptom of excess yang energy. Either magnetite or “dragon bones” are recommended for insomnia associated with hysteria or fear. Chiropractic. Spinal manipulation can reduce stress upon the nervous system, thus allowing relaxation. Colored light therapy. Treatment with true green light can balance the nervous system and may relieve insomnia. Homeopathy. Homeopathic remedies are chosen according to the specific causes of insomnia. They may include: Nux vomica (alcohol or substance-related sleeplessness), Ignatia (emotional upset), Arsenicum (anxiety), Passiflora (mental stress, aches, and pains), and Lycopodium (talking and laughing during sleep). Light/dark therapy involves making the bedroom very dark at night and exposing the patient to early morning sunlight (or a light box). Low-energy emission therapy (LEET) is a clinically proven treatment for chronic insomnia. LEET treatment involves delivering electromagnetic fields through a mouthpiece. Massage. Therapeutic massage can relieve the muscular tension associated with chronic insomnia. Meditation. Regular meditation practice can counter-act emotional stress. Reflexology. The use of the reflexology points for the diaphragm, pancreas, ovary/testicle, pituitary, parathyroid, thyroid, and adrenal gland helps to relieve insomnia. Visualization may help to promote relaxation. Yoga can promote relaxation by releasing muscular tension. Treatment for a sleep disorder depends on its cause. In some cases, rearrangement of the bedroom or changes in sleeping arrangements may be all that is needed. Sedative or hypnotic medications are generally recommended only for insomnia related to a temporary stress because of the potential for addiction or overdose. Trazodone, a sedating antidepressant, is often used for chronic insomnia that does not respond to other treatments. Hypnotic agents include lorazepam, temazepam, and zolpidem. Bright-light therapy, which was originally introduced as a treatment for seasonal affective disorder,is being tried as a treatment for insomnia in elderly adults. Although the results are not conclusive as of 2002, this form of treatment does appear to benefit many patients. In addition, it does not involve medications, which are more likely to produce side effects in the elderly than in younger patients. Narcolepsy is treated with such stimulants as dextroamphetamine sulfate or methylphenidate. Nocturnal myoclonus has been successfully treated with clonazepam. Children with sleep terror disorder or sleepwalking are usually treated with benzodiazepines. Children with nightmare disorder may benefit from limits on violent or frightening television programs or movies. Psychotherapy is recommended for patients with sleep disorders associated with other mental disorders. Patients with sleep apnea or hypopnea are encouraged to stop smoking, avoid alcohol or drugs of abuse, and lose weight to improve the stability of the upper airway. In children and adolescents, removal of the tonsils and adenoids is a fairly common and successful treatment for sleep apnea. Most sleep apnea patients are treated with continuous positive airway pressure (CPAP). Sometimes an oral prosthesis is used for mild sleep apnea. The prognosis depends on the specific disorder. Natural remedies often require several weeks to have noticeable effects. Children usually outgrow sleep disorders. Narcolepsy, however, is a lifelong disorder.